A last-ditch slide job with two laps to go helped Logan Schuchart etch his name into The Dirt Track at Charlotte history books on Friday. 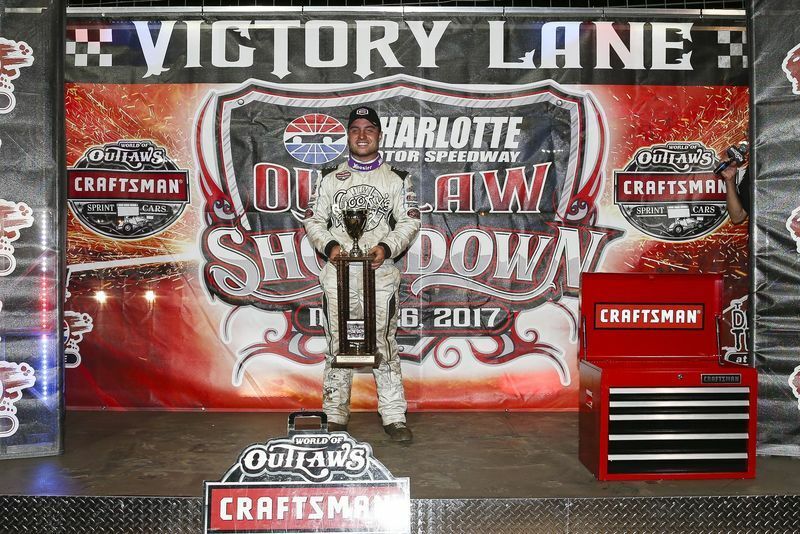 In a breathtaking finish to the Outlaw Showdown, Schuchart made a spectacular move on Brad Sweet in Turn 1 to collect his third World of Outlaws Craftsman Sprint Cars win of the season. "I had a chance at Brad earlier in the race and I went to go in the corner and slide him just like I did (with two laps to go), but my throttle stuck and ran me way too far into the corner," Schuchart said. "It's great to win anywhere but to win in front of Charlotte's fans, this is what makes our sport. … I have a great group of people behind me in the Shark Racing family. Brad drove a great race and I couldn't catch him for a while, but some lapped cars got in his way and they helped me out. That's what makes racing exciting. We were able to capitalize at the right time." Sweet held on for second ahead of Daryn Pittman, his Kasey Kahne Racing teammate. Sweet led the first 28 laps before surrendering the lead. "If you look at the overall night it was good for us, but obviously you hate to lose one like that," said Sweet, who won the pole, the dash and his heat race. "I don't want to be a poor sport. Logan drove a great race. I struggled to get by those lapped cars. I just got stuck there. That's what wins you or loses you those races. He did the better job there at the end and I just kind of got caught. I was a sitting duck. I'd kind of burned my tires out. I didn't drive a great race, but hats off to our NAPA guys. They worked hard. It was good to put on a show for this great crowd." Defending series champion Donny Schatz wound up fourth with Greg Wilson, last year's race winner, fifth. Kraig Kinser and Schatz joined Sweet as heat winners. Justin Williams held off Thomas Robinson, Chris Ferguson, Trent Ivey and Timbo Mangum to score the win in South Eastern Crate Association Late Model competition. "I apologize to the No. 78 (Robinson) because I might've gotten into him racing for the win, but that's great racing," Williams said. "This is probably the biggest crowd I've ever won in front of. This is awesome." The World of Outlaws World Finals will commence on Thursday, Nov. 2 and will run through Saturday, Nov. 4. Fans can buy tickets to upcoming speedway events by calling 1-800-455-FANS (3267) or visiting http://www.charlottemotorspeedway.com/tickets/. Heat 1 (8 Laps): 1. 49 - Brad Sweet; 2. 1S - Logan Schuchart; 3. 93 - Sheldon Haudenschild; 4. 49X - Tim Shaffer; 5. 22 - Cole Duncan; 6. 71M - Dave Blaney; 7. 19 - Brent Marks; 8. 47 - Eric Riggins Jr.
A-Main (30 Laps): 1. 1S - Logan Schuchart; 2. 49 - Brad Sweet; 3. 9 - Daryn Pittman; 4. 15 - Donny Schatz; 5. W20 - Greg Wilson; 6. 11K - Kraig Kinser; 7. 2 - Shane Stewart; 8. 5 - David Gravel; 9. 1A - Jacob Allen; 10. 93 - Sheldon Haudenschild; 11. 49X - Tim Shaffer; 12. 19 - Brent Marks; 13. 22 - Cole Duncan; 14. 41 - Jason Johnson; 15. 7K - Cale Conley; 16. 13 - Clyde Knipp; 17. 44 - Trey Starks; 18. 17 - Joey Saldana; 19. 7S - Jason Sides; 20. 4S - Danny Smith; 21. 47 - Eric Riggins Jr.; 22. 71M - Dave Blaney; 23. 4 - Paul McMahan; 24. 1 - Zach Ames. B-Main 1 (8 Laps): 1. 6 - Dillon Brown; 2. 17 - Logan Roberson; 3. F1 - Peyton Freeman; 4. 08 - Layton Sullivan; 5. 10 - Spencer Apple; 6. 5 - Travis Steele; 7. 54 - Justin Wofford; 8. 89T - Timmy Harrelson; 9. D52 - Brad Basey; 10. 11 - Cole Apple; 11. 4 - Danny Sanders; 12. 27 - James Plemmons; 13. 00Jr - Richard Kuiken Jr.
B-Main 2 (8 Laps): 1. 2F - Rambo Franklin; 2. 1 - Mark Parks; 3. 44 - John Ruggiero; 4. 00 - Carson Ferguson; 5. 89 - Pat Lindsay; 6. 77 - Brian Connor; 7. 30 - Kole Hardy; 8. 27H - Justin Hudspeth; 9. 17J - Jeff Johnson; 10. 07G - Kerry Gibbons; 11. 75 - Matt Long; 12. 421 - Anthony Sanders; 13. 444 - Teddy Musgrave Jr.
A-Main (25 laps): 1. 2 - Justin Williams; 2. 78 - Thomas Robinson; 3. 22 - Chris Ferguson; 4. 88 - Trent Ivey; 5. T1 - Timbo Mangum; 6. 9 - Ryan Atkins; 7. 23 - Corey Gordon; 8. 6 - Dillon Brown; 9. 08 - Layton Sullivan; 10. 2F - Rambo Franklin; 11. 44 - John Ruggiero; 12. 07T - Dale Timms; 13. 1W - Ricky Weeks; 14. J1 - Joshua Bishop; 15. 17 - Logan Roberson; 16. 77 - Brian Connor; 17. 5 - Travis Steele; 18. 00 - Carson Ferguson; 19. 1 - Mark Parks; 20. 54 - Justin Wofford; 21. 10 - Spencer Apple; 22. F1 - Peyton Freeman; 23. 07 - Larry Timms; 24. 89. Pat Lindsay.